BRUSSELS – A three-day forum of political heavyweights from the EU and China ended on Wednesday with kind words at a half-hour press conference. The EU-China High-Level Group, the second of its kind after a first encounter in Beijing last year, brought together the leaders of the big European political families and representatives of the Communist Party of China (CPC). “We discussed EU-China co-operation, social development and reforms, the construction of democracy and legal systems, sustainable development, and global economic governance,” said MEP Reinhard Buetikofer of the Greens, who chaired the meeting. The discussions were held in “a spirit of co-operation”, accoring to MEP Veronique De Keyser of the Socialist group in the parliament. “Participants from both sides understand that only with constructive dialogue, mutual trust and tolerance can we enhance understanding, avoid misjudgement and lay a solid foundation for our partnership,” said Li Jinjun, deputy minister of the central committee of the CPC. “To us Europeans, the forum has been a success. There is an evolution in the quality and the openness of the speeches. It is the liberty of the tone that marks this forum’s success,” said De Keyser. “We used to just make our statements without there being much debate at all. But this time around, we really had an exchange of views, and I think that is great progress. [The forum] doesn’t lead to any concrete political outcome but it does add to understanding.” said Markus Loening, vice-president of the European Liberal Democrat and Reform party and German commissioner on human rights. The forum’s busy programme, held nearly entirely behind closed doors, included a meeting with Jerzy Buzek, president of the European parliament, and speeches from several MEPs and EU trade commissioner Karel de Gught and social affairs commissioner Laszlo Andor. “The EU is committed to help China’s transition towards an open society, support China’s economic and social reforms, and integrate China even further into the world trading system,” said Andor. 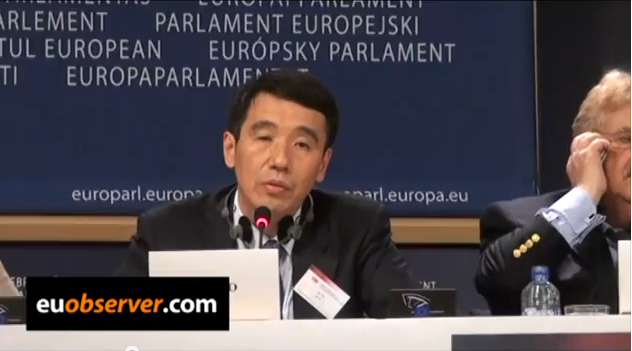 True to the spirit of the meetings, Xie Duo, director-general of the financial market department of the People’s Bank of China, said that he trusts the euro will survive the crisis. “We think that the crisis is temporary. We believe that European governments will find the way out of the crisis. We believe that the euro will be strong and stable. The Central Bank of China supports the European Central Bank and the International Monetary Fund for their support to the euro currency,” he said. Vladimir Putin has said he wants to forge a “Eurasian Union” on the vast swath of territory that used to be the Soviet Union to compete with the European Union and the United States. Speaking six months before he reassumes the Russian presidency for the third time, Mr Putin said he wanted to create a global power bloc that would straddle one fifth of the earth’s surface and unite almost 300 million people. The Russian prime minister called the 1991 collapse of the Soviet Union “the greatest geopolitical catastrophe of the 20th century” and is known for revelling in Soviet nostalgia. He denied his new plan was an attempt to resurrect the Russian-led superpower, insisting that the Eurasian Union would be freer than the Soviet Union and membership would be voluntary. 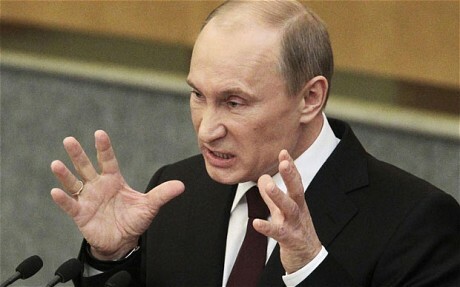 “We are not talking about recreating the USSR,” Mr Putin claimed. The Soviet Union included 15 different republics which became independent countries after its chaotic collapse in 1991. Three of those countries – Estonia, Latvia and Lithuania – have since become members of the EU and it is unimaginable that they would sign up to the Eurasian Union. Georgia, a country that lost 20 per cent of its territory in a war against Russia in 2008, would also be highly unlikely to acquiesce. But Mr Putin said an existing kernel of three countries – Russia, Kazakhstan and Belarus – were already locked into a new common economic space with shared customs and other rules that would serve as the foundation for the Eurasian Union. Mr Putin said he expected Tajikistan and Kyrgyzstan to sign up soon. “We are talking about a model of a powerful supranational union capable of becoming one of the poles in the modern world,” he said. 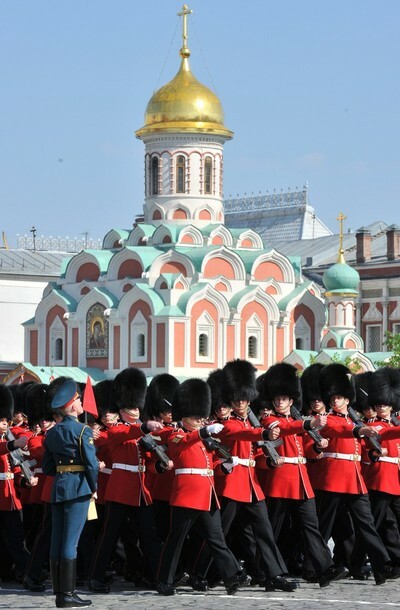 MOSCOW — U.S., French and British troops strode across Red Square for the first time Sunday in a Victory Day parade marked both by the usual impressive display of Russia’s military might and by an unusual emphasis on international cooperation. In recent years, the parade commemorating the 1945 defeat of Nazi Germany has been used by Russian leaders to launch veiled criticism of the West, but President Dmitry Medvedev struck a different tone this year. Foreign leaders in attendance included German Chancellor Angela Merkel, China’s Hu Jintao, Israeli President Shimon Peres and acting Polish President Bronislaw Komorowski, whose predecessor died last month in a plane crash in western Russia along with many of Poland’s political and military elite. Italy’s Silvio Berlusconi and France’s Nicolas Sarkozy had been expected to attend, but stayed home in order to be available for possible developments in Europe’s financial crisis. Victory Day, Russia’s most important secular holiday, always sees elaborate observances throughout the country, but this year’s was especially intense, with holiday preparations and parade rehearsals dominating TV news reports for the past week. Such attention appeared in part to be a tacit acknowledgment that even the youngest World War II veterans are in the last years of their lives. Some of Medvedev’s address carried that valedictory sentiment, assuring the veterans that recognition of their valor would outlive them. “This war made us a strong nation,” Medvedev said. The military strength was on clear view. Tanks, armored personnel carriers and lumbering Topol-M intercontinental ballistic missile launchers rumbled across the square, and warplanes and helicopters streaked overhead. The display included WWII-era T-34 tanks and some military units wore period uniforms. The U.S., British and French troops each marched in units of about 75. Squads from Poland and Turkmenistan also took part. Parades and other celebrations also took place throughout the country. But amid the nationwide assertions of strength and pride were violent reminders of the unrest that plagues Russia’s Caucasus republics. A bomb placed by the side of a road near a Russian military base killed two people in a car Sunday and a sapper was killed when he approached another bomb also in the city of Kaspiisk — where a Victory Day parade bombing in 2002 killed 43 people. A third explosive device was found and disabled Sunday at the entrance to a park in the city of Makhachkala. Both cities are in Dagestan, which is Chechnya’s eastern neighbor and has been plagued by insurgent violence for more than a decade. Insurgents have often chosen the holiday to launch terrorist attacks, including the 2004 killing of Chechen President Akhmad Kadyrov, who died in a bomb blast while attending a military parade at a stadium. In the week leading up to Victory Day, Medvedev several times raised Russia’s frequent complaint that other countries denigrate or misconstrue the Soviet Union’s contribution to World War II, in which more than 26 million Soviets are estimated to have died, including more than 8.5 million soldiers. But he mentioned the issue only in passing on Sunday and the address reflected his aim of reducing Russia’s confrontational image. 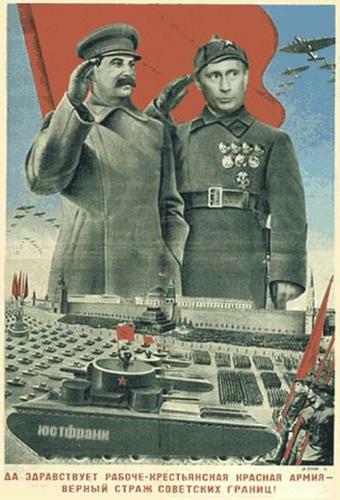 Medvedev also used the Victory Day preparations to criticize Josef Stalin, the Soviet dictator whom many supporters credit with leading the Red Army to victory in the war. Some Moscow museums displayed small posters of Stalin ahead of the holiday and a splinter Communist faction painted his face on a city bus in St. Petersburg, fueling fears that his reputation was being quietly rehabilitated. 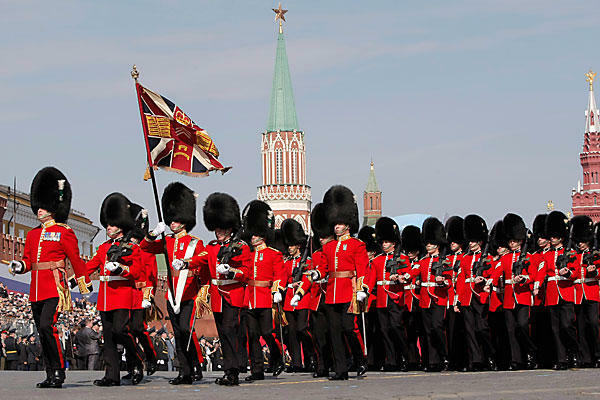 This year’s Red Square parade – which included soldiers from four NATO countries, including the US – was the most elaborate since the collapse of the Soviet Union almost 20 years ago. 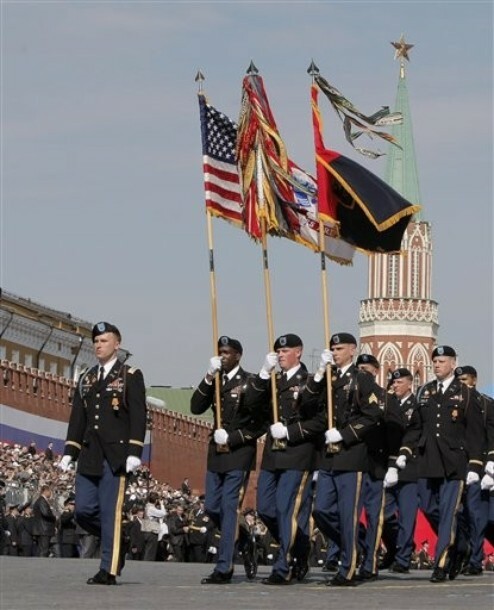 Soldiers from four NATO countries, including the US, joined about 10,000 Russian troops for a massive military parade across Red Square on Sunday to mark the 65th anniversary of the defeat of Nazi Germany. This year’s Red Square parade was the first time foreigners have ever taken part in the march, an annual red banner and hammer-and-sickle festooned event that continues to evoke powerful emotions in the former USSR, which lost 27-million people in World War II. Russian President Dmitry Medvedev, joined by German Chancellor Angela Merkel, Chinese President Hu Jintao, and about two dozen other high-level foreign guests watched the parade from the same granite viewing stands, next the mausoleum of Bolshevik leader Vladimir Lenin, formerly occupied by Communist leaders. This year’s parade was the most elaborate since the collapse of the Soviet Union almost twenty years ago, featuring almost 200 tanks – including vintage wartime vehicles – mobile howitzers, anti-aircraft rockets, and giant intercontinental missiles rumbling across Red Square’s pink cobblestones, and followed by a thundering flyover by 150 modern warplanes and helicopters. During the cold war, military parades were closely watched by Western intelligence agencies because they often were employed as a showcase for new weaponry. The Kremlin didn’t disappoint this year, rolling out six recently-developed hardware systems: the Pantsir-S1 and Buratino anti-aircraft rockets, the Topol-M intercontinental missile, and the Yak-130 air trainer. Military experts show particular interest in two new attack helicopters that were displayed in public for the first time, the Mi-28 – Russia’s answer to the Apache – and the exciting new Ka-52 gunship. Despite the sovietesque atmospherics, the main political theme of the event was historic reconciliation between Russia and its former cold war foes. “Today, at the military parade, soldiers of Russia, of countries of the former Soviet Union, and of the Allied powers march together, in one column, which is evidence of our common readiness to defend peace,” Mr. Medvedev said in a Red Square address. Communist and nationalist politicians had denounced the invitation to NATO troops to take part in the parade, but a poll last week by the independent Levada Center in Moscow found that less than a third of Russians agreed with them, while 55 percent viewed the participation of the wartime allies favorably. Another controversy swirled around a decision by Moscow Mayor Yury Luzhkov to include portraits of Soviet dictator Joseph Stalin, who led the country through World War II, among the publicity materials for the Victory Day celebration. The Russian government rescinded that decision, and no pictures of Mr. Stalin were visible around Red Square on Sunday, but the furore illustrates the ongoing sensitivity of many unresolved Soviet-era historical disputes in Russia. The Voice of America quoted the commander of the participating American unit, Capt. Matthew Strand, as saying that the experience of marching in Russia’s Victory Parade raised the level of camaraderie between NATO participants and their Russian counterparts. Captain Strand told the VOA that his 90-year-old grandfather was a US pilot during the war. The inauguration of the Russia-Kazakhstan-Belarus customs union at the beginning of this year gave a very visible push to the Kremlin’s long-term goal of economic reintegration of the former Soviet republics. There has never been any doubt that the Russian government would play the leading role in decision making, whether in a customs union or the in the next step foreseen, a single market that could soon become a reality. Many analysts interpret the Kremlin’s intent as to re-create a kind of modernized Soviet Union, at least at the economic level. It’s early days yet for the customs union. The three countries began applying common tariffs on 1 January, and a few types of products are temporarily exempt. But the impact of the new measures is provoking indignation among consumers in Kazakhstan, who are upset over higher prices for a wide range of goods. “Why does a new Toyota Camry made in Russia [now] cost 40,000 American dollars when all over the world the price is just 22,000?” one blogger complained on a Kazakh Internet site. In Kazakhstan you can hear the view that the system of common tariffs is working to strengthen Russia’s positions. Some Russian officials are openly saying that the new tariff setup is based largely on the Russian system. And Moscow’s ambitions go well beyond the customs union now in place. The Russian, Kazakh, and Belarusian leaders have approved documents to establish a “common economic space” on 1 January 2012 – a single market for goods, investment, and labor. When the three countries’ presidents signed the documents establishing the customs union in November they promised that it would boost trade, make their countries more competitive, and promote investment opportunities. Kazakhstan’s president, Nursultan Nazarbaev, put the combined trade turnover of the three members at $900 billion. Although that is probably an embellishment, as leaders of post-Soviet states often tend to overstate figures relating to intrastate economic schemes, the customs union does have enormous potential, and, as Nazarbaev also declared, it could become a major exporter of oil and grain in the future. The new tariff system could unleash a flood of imports of all sorts, they warn, undermining domestic producers’ market positions and perhaps causing an upturn in inflation. In 2007, Kazakhstan exported about $46 billion worth of goods and services, dominated by hydrocarbons, and imported about $30 billion worth, according to the World Bank. At first glance it may seem that domestic producers in Kazakhstan now have a price advantage over imports, because of the higher import duties. The truth is that old marketplace rivals have given way to new ones. The Russian government is the dominant influence over common economic policies in the customs union’s coordinating structures. Kazakh companies may now face a raft of new competition from Russian firms under less than equal conditions. Economic data alone underline Russia’s leading role in the new customs union and proposed single market. Although the Kazakh economy is one of the largest of the ex-Soviet republics, with a 2008 GDP estimated by the World Bank to be $132 billion, it’s less than a tenth the size of Russia’s. Coming close on the heels of the launch of the customs union, the victory of a close friend in the Ukrainian presidential election will give new impetus and vigor to the Kremlin’s aim of further asserting its dominance of the post-Soviet economic space.